'Grace Kelly's Dress' (Merrion Square). "Dublin's Georgian townhouses act as settings, characters and multilayered symbols in three compelling novellas, set after the financial crash of 2008. A young couple drift apart as they face the threat of losing their home. A wealthy widow is haunted by her perceived failure as a mother to a bland and money-grubbing son. A woman whose husband died just after their honeymoon becomes a recluse in her vast, inherited house, attended by grateful tenants who could otherwise not afford to live there. Rooms stand for the characters' emotional ghosts, such as in the case of reclusive Maud, who avoids her opulent dining room where her wedding gifts are still unopened. The houses have biographies as carefully plotted as their inhabitants. Described in vivid detail, the reconfigurations of interiors – from grand colonial residences to desirable flats, meagre bedsits or modern mansions – chart developments in Ireland's troubled history. Symbols of a violent colonial past, and of modern-day bankers' greed, the houses are beautiful objects that elicit conflicted responses. These deeply affecting stories depict a precarious world of evictions and repossessions, where acts of kindness sound a bright redemptive note. A powerful study of the human cost of financial collapse." "A Stylish Production, and Undoubtedly Stylish Tales." 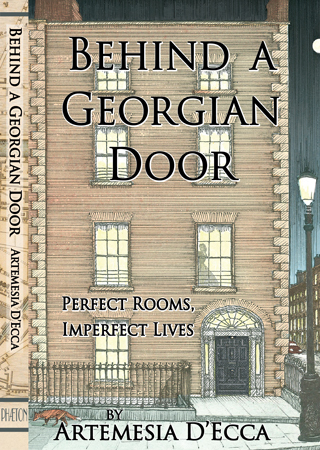 "… firmly rooted in modern day Dublin, reflecting Irish society after the economic collapse of 2008… The idea behind the book must draw in anyone…who does not live in one of the grand Georgian houses that characterize Dublin but who has often wondered just what life is like behind those elegant neo-classical doors. …Haunting all the stories is the history of the houses in which the action takes place. …D'Ecca has performed the challenging task of dealing with difficult subjects with a light touch and even humour. …She has imaginatively responded to our curiosity about these old Georgian houses as she reveals three domestic dramas which take place in three different types of household. There is wit and charm here but also portrayals of the hardships and cruelties that lie beneath the surface." — MIDWEST BOOK REVIEW, Wisconsin, USA. … My idea was that we should just 'disappear' – I'd read online about … doing that; we could post the keys of the house to the bank, leave the country, and then vanish from the bank's sight until maybe it couldn't chase us for the debt anymore. I thought we should at least look into the idea of disappearing, but somewhere in Europe, so that Reggie wouldn't lose touch with her grandparents. Martin said the idea was mad. …'Do you know whose house it was?' my grandmother asked.